The following is a non-developer guide to install RetroArch on non-jailbroken iOS devices. We're going to try to improve the process and possibly include the iOS cores in a download, but until then, here is a way to build RetroArch to get it running on your iPhone, iPad, or Apple TV. Emulator cores are needed to use RetroArch as they contain the code that drives the emulation of the system of the game you want to play. Unzip the above archive of cores into the following directory in the RetroArch project: pkg/apple/iOS/modules. The core files should have the extension of .dylib. Once you’ve successfully logged in, a new "Personal Team" with the role "Free" will appear beneath your Apple ID. You'll need to assign the Developer credentials you just created above to the RetroArch project before you can run it on your device. 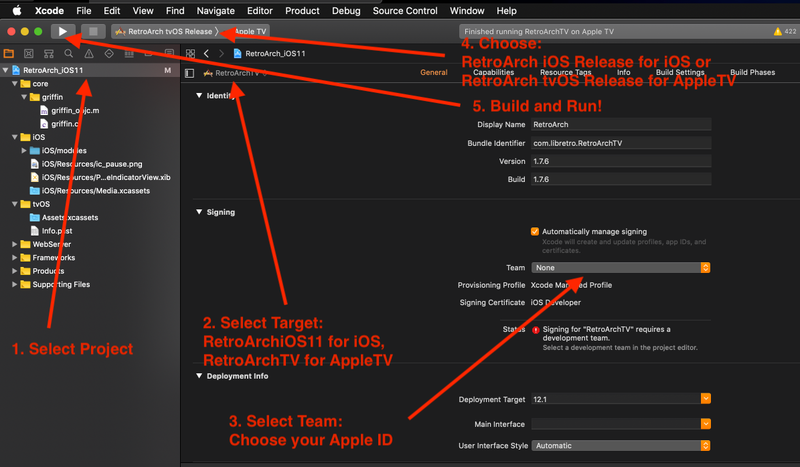 Click on the project name, select the target you're interested in (RetroArchiOS11 for iOS, RetroArch TV) and change the "Team" to the role you created above. On the iPhone and iPad, you'll be presented with a touch interface. If you have an mFi controller, you can control the interface that way as well. On the Apple TV, you'll be shown the "XMB" (PS3-like) interface. You need to use an mFi controller with an Apple TV. The Siri Remote is not supported yet. From the main menu, choose "Online Updater"
Do not choose "Core Updater"! That will not work on iOS. If you want more visual flair in the interface, you can change it by going to "Settings" -> "Driver" -> "Menu Driver". You might need to restart to see it take effect. Use a 3rd party utility like iFunBox or iExplorer to transfer ROM files to the RetroArch app directory. When you start RetroArch, you'll be presented with a screen with a web address that you can access on your computer to transfer files to the RetroArch app directory on your Apple TV.